Liczba stron: 53 Jest to ujednolicona liczba stron, która ułatwi Ci porównanie długości książek. Każda strona Legimi to 200 słów. The Facts on Vitamin and Mineral Supplementation for AthletesIt is estimated that in the United States alone last year consumers spent close to 30 billion dollars on vitamin and mineral supplements. But are vitamin supplements necessary? And if so, who is most likely to need to supplement and what vitamins are actually necessary? And can some of these vitamins make us sick in excess? Surprisingly, of the consumers spending that money for vitamin supplements, very few are likely well informed about why these nutrients are even necessary (if they are necessary at all). And the vitamin industry is not in any rush to educate consumers willing to spend 30 billion dollars. This book is written for the person that is probably able to benefit the most by vitamin and mineral supplementation, and that is someone who is active or involved in athletic activities. The truth is, it is likely that someone who leads a passive lifestyle and eats a well rounded diet has little need to take vitamin supplements. However, as individuals increase their activity levels or put their bodies under specific training workloads, it is beneficial to understand the types of vitamin deficiencies that can occur. This is especially important for those who follow a strict vegan or raw organic food diet.Understanding Your True Nutritional Needs is the First Step Towards Realizing Your Full Athletic Potential! © Copyright 2015 by Paul Rogers - All rights reserved. 51% of the Earth’s land mass today is used to feed the ever growing human population. In the mid-80s of last century it became clear that overuse of the land has led to the exhaustion of a few critical microelements essential for our lives and normal functioning. The scientific community has been working overtime to address this problem. As a result of this collective effort, since 1990 several global interventions have been made in an effort to enrich the common types of food with vitamin A, zinc, iron and iodine – micronutrients that weren’t present in their optimal levels in crops and other food sources. This is done through the fortification of processed food but also by adding fortified fertilizers to crops. The latter showed the most promising results and today every crop around the globe is using fortified fertilizers to provide plants with essential trace elements but also with micronutrients essential for humans. What made this simple improvement possible was a food chain. You enrich the plant, animals eat the plant, and humans then eat the animal or eat the plant and ingest all the fortified nutrients in the process. Scientists took advantage of technological advances and started to fortify processed foods also. The latest research indicates that the problem of nutrient deficient food has been solved even in developing countries. Today every food source contains optimal levels of those four micronutrients. But that doesn’t seem to stop pharmaceutical companies from pushing their products through profit-driven marketing in areas that do not have any need for additional supplementation of micronutrients. 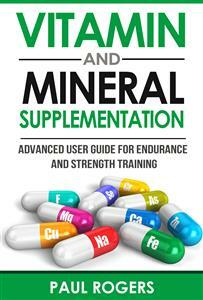 Companies have created a lot of buzz about the need for vitamin and mineral supplementation. On the wings of their marketing success the supplement industry has been thriving over the last two decades. And forward looking predictions show continued great sales potential for them. The marketing behind the many available products does not discriminate. There are products ranging from those for newborn babies, adolescents, adults, athletes and senior citizens that claim vitamin fortification. At first glance it looks like hype. And when we see hype, we have to be cautious. If history has taught us anything it is that hype is a common sociological sign of misinformation. In 2014, in the US alone there were close to 152 million units sold of different vitamin and mineral supplements. Most of them were targeting a condition specific market such as health and highly focused illnesses, aging and active lifestyle. The active lifestyle population is the primary objective of this book. Those who are healthy, and who don’t spend significantly larger quantities of energy and live more or less sedentary lives while feeding on the traditional Western diet consisting of meat, vegetables, dairy products and fruits don’t have to supplement with additional micronutrients.